(TibetanReview.net, Jul14, 2018) – In the murky politics of China, it is a challenge for scholars and policymakers to decipher the meaning and motive of official speeches and documents. What the party leaders said or revealed to public cannot be read at their face value. This is also true with other politicians as well; they are known for their skills to say something but do or mean something else. But in the case of Chinese politics, with an increasingly insular party that can make the press to parrot what it wants, the task to untangle what they said in the public is an even more hard nut to crack. Nevertheless, as difficult as it is, it is also tempting intellectually to understand what they really mean. Coming to the point, this piece analyses Xi Jinping’s speech at CPC’s recent national conference on organizational work held from July 3 to 4 in Beijing. While the major theme is on strengthening the party, the main emphasis on party members’ undivided political loyalty to Xi-led party and his thought. Below are some terms/phrases used by Xi in his speech and the decoding of their likely meanings. Xi said that “intra-party political ecosystem has improved markedly”. This implies that he is quite happy with power he consolidated which he did through his anti-corruption campaign whose main targets have clearly been rival factions. In fact, his thought was again written into the constitution of Communist Youth League last week which is known to be bastion of his predecessor Hu Jintao’s power. While Xi has been successful in solidifying his position at the top, it seems there are some obstacles on him from get his ideas and policies implemented at the local levels. The clue comes when he said that while the party’s Central Committee must have the final say, it is the fundamental duty of local party branches to implement the decisions. This is normal thing for the CPC – that there is a gap between the ‘final authority’ of top level to order policy decisions and the ‘fundamental duty’ of local authorities to implement them. Xi’s stress on the division of labour/power indicates that there is some delay or distortion of his policies at the local levels. 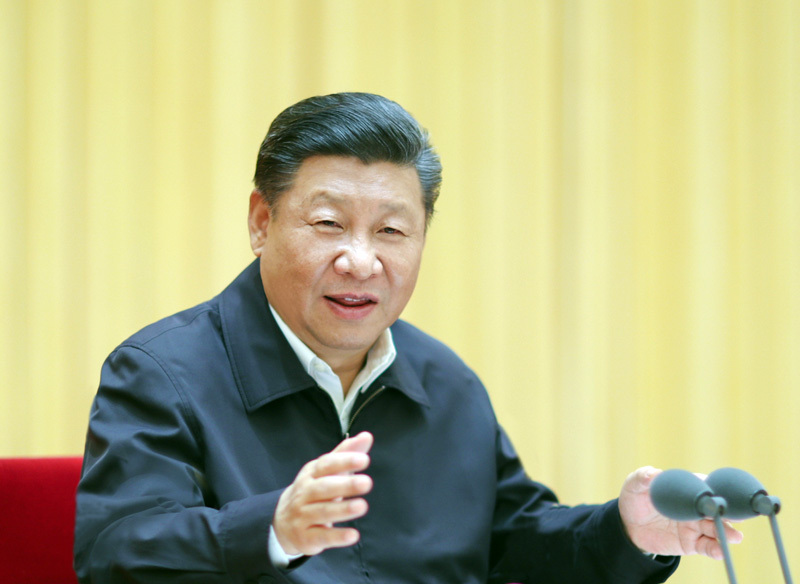 Xi also called for efforts to transform the party into a “vibrant Marxist governing party” [and] “enhance the Party’s organizations in enterprises, rural areas, governments, public institutions and urban communities.” There are two aspects here, the ideological and organizational. Under Xi, there is more official reference to Marxism, extolling Marxist theory as greatest ideas that will guide China to its bright future. With the party remaining communist but only in name and ruling a country grappling with crony capitalism and acute wealth gap, Xi Dada’s appeal for Marxism can be an attempt to put some ideological paint to hide the rusts and cracks of a party whose foundation was cemented in communist revolution rather than in capitalist rhapsody. On the organizational front, it is clear that Xi wants to intensify the ‘partification’ of every section of state and society. This recentralisation of power to the party goes hand-in-hand with growth of his cult personality similar to Mao. Within Chinese politics, Xi aspires for a status more akin to chairman Mao and he has party propaganda machineries rallying for him. However, Chen Xi, who is the head of the CPC Central Committee Organization Department, made a strong call to party members to “resolutely safeguard Xi’s core status, and the authority of the CPC Central Committee and its centralized, unified leadership”. There is a flip side to this firm assertion that either there is some remnant of resistance to Xi’s power gripping or there is still some insecurity on the part of Xi about his own position. That’s understandable in the politics of power – the more you gain at the cost of your rivals, the more risks there are of revenge. Therefore, what concerns Xi the most is the loyalty of those surrounding him and taking his callings. Xi has made a contradictory statement that the party promises to select party members based on their integrity and capabilities rather than on their background. However, that is not really the case. There is one thing that the party leadership will not compromise when it comes to selecting its official – that political background matters more than anything else. Another less talked about but obvious factor is the nationality or ethnicity of a party member – that a Tibetan or Uighur or Mongolian party member will not make it to the upper echelon of power in Beijing. During the more than six decades of Chinese rule over these regions, not a single ethnic leader has got appointed as party secretary of any of the so-called autonomous regions. The chasm between the party’s theory and practical reality is due to the trust deficit inherent in the relationship between a central power and its peripheral colonial regions. I will stop my digression here. So, coming back to the issue of political loyalty, Xi mentioned clearly that “political integrity will be the foremost criterion for selecting officials,” by which he means that party members should not have a second thought on what the party leaders command them to say or do. Professing allegiance to the party is not enough; the regime says it will devise a supervisory system to check on party cadres regarding their faith and work ethics. In other words, there will be internal supervision of party members about their political view, which is something similar to the practice during Mao’s era. By demanding political loyalty to the party, what Xi is really up to is that he wants undivided faith in him as the core leader. He explicitly called for nurturing of young, dynamic and highly qualified “officials who are loyal to [his] Thought on Socialism with Chinese Characteristics for a New Era”. However, this should not surprise anyone, given that in an authoritarian system, opposition is outlawed, including even from otherwise loyal ones. Xi’s main message to the multi-million party members is that political loyalty to him and his policies is imperative for career in the party. For Xi, sycophancy is great and silence is welcome but no unwarranted noise –not even with love.